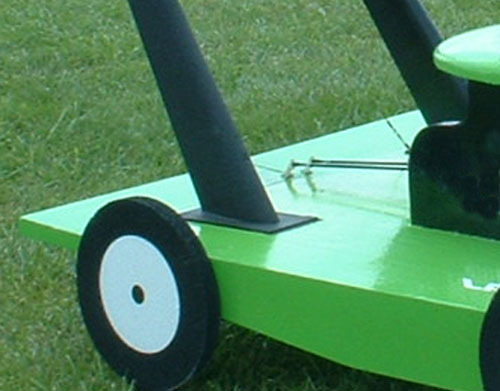 The Infamous Flying Lawnmower - You gotta see it to believe! Flying Lawnmower? You think I'm joking right? It definitely threw me for a loop the first time I seen one! One spring afternoon my wife and I stopped by the local flying club to see what it was all about before making the decision to join. Being new to the hobby, I was sitting back and taking it all in. I was like a kid in a candy store watching all those cool RC airplanes and helis flying all over the place. I didn't think much of it when one of the guys came out on the landing strip with his push mower. Obviously he was just trimming the grass a little to make for better landings right! Imagine what went through my mind when this RC lawnmower suddenly started rolling by itself and gently lifted off into the sky! It was truly a moment of disbelief to say the least! I was completely mesmerized! Not only was it flying, it was flying well! It was doing all kinds of loops and rolls. It looked and sounded exactly like a real lawnmower! It was one of those rare moments in my life that I will never forget! 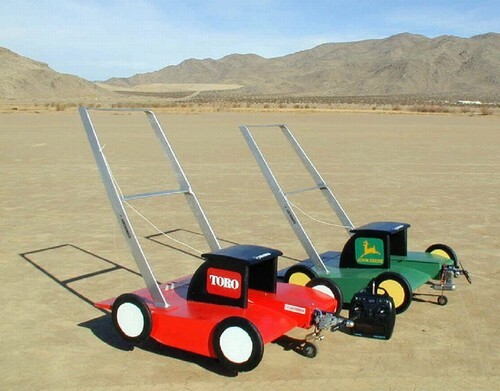 If you've never seen an RC lawnmower, I really hate to ruin it for you by showing you a video. You may be wondering how in the world this contraption is controlled? If you look closely at the above picture on the right, you will see two control surfaces at the bottom rear of the lawnmower. These control surfaces act as both ailerons and the elevator. This set-up is known as an elevon. All you need is a standard four channel radio system that has elevon or "V-tail" mixing capabilities. The elevon mix programmed in your transmitter will combined your elevator and aileron stick movements to make the elevons on the RC lawnmower move accordingly. Believe it or not, the kits to build these are fairly cheap. The Sky Cutter Kit comes with everything you need to build this RC lawnmower less than 150 bucks! You will only have to spend a couple nights in the garage before it's ready for the friendly skies. In addition to the four channel radio with eleven mixing, you will need 40 to 60 size two-stroke or 45-72 four-stroke engine to get this flying lawnmower in the air. This contraption really is a hoot. Our flying club has an annual RC air show and they always pull out the good o'le RC lawnmower. Since I know what's coming, it's a lot of fun watching peoples' reaction when this thing takes off! 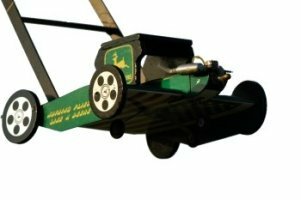 Flying Thingz, the company that makes the flying lawnmower, also makes some other bizarre flying contraptions such as the Flying Snoopy Doghouse, an M1A1 Flying Tank, a Flying Indy Car, a Flying Witch On A Broom, and even Uncle Sam riding an American Flag! Think flying lawnmowers are cool? Check out these pages!